Please select your desired model. An office magnet that is strong and pretty! The whiteboard magnet Boston Xtra contains a super magnet and is therefore two to three times as strong as a standard ferrite office magnet. It scores additional points with its fresh and cool design and lush colours. Designed in Austria, assembled and packaged in a sheltered workshop in Switzerland: A solid quality product you will enjoy for a long time. Allow for a hint of design and elegance in your office with these hip, extra strong and durable super magnets. Available in three shapes (round, triangular, rectangular) and five colours. Made of robust, light-fast ABS plastic. Each set contains 5 magnets. The triangular magnet is a novelty and exclusively available at supermagnete. 1 pc. 5,90 EUR ea. 1 pc. 11,90 EUR ea. 1 pc. 136,08 EUR ea. Our newly developed Boston Xtra is strong: 1,5 kg adhesive force - that is two to three times as strong as a standard ferrite office magnet. The magnet can hold several sheets of paper and even a piece of cardboard. The secret of its strength is a super magnet, which is embedded in the plastic shell without adhesive through a newly developed clip mechanism. That makes the whiteboard magnet light and strong at the same time. To ensure that the magnet really remains in the plastic shell permanently, the Botston Xtra has been tested more than 100'000 times on a metal plate. And it stayed in place. The Boston Xtra has been developed for us by an Austrian designer. The elegance of its softly curved edges and its slightly textured surface is visually appealing. Thanks to its ergonomic grip and outstanding adhesive force it achieves full functionality as well. The plastic shells and the packaging are produced in Austria. The neodymium magnet stems from Chinese production. The magnets are assembled and packaged in Switzerland by our partner "Murghof Werkstätte," which provides jobs for people with disabilities. The cap is made of very robust and light-fast ABS. It is the same material that legos are made of. All in all, a high-quality, carefully manufactured product we are proud of. The packaging is made of cardboard and a window face. The back of the box is labelled in six languages and features an EAN-13 barcode. That makes it very suitable for resale. Each set contains five magnets of the same colour. Additionally, we offer an assorted set with one magnet of each colour. 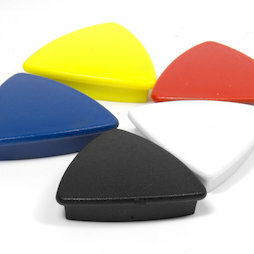 The organising magnet is available in black, white, red, blue and yellow. The corresponding RAL numbers are: 9011, 9016, 3020, 5017 and 1016. The office magnet is available in three different shapes: round, triangular, square. The triangular magnet is a novelty and exclusively available at supermagnete. We have an interesting offer for resellers. 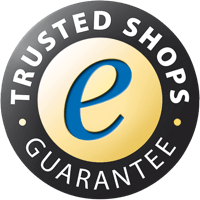 Contact us via e-mail and we will send you our reseller terms and specials. The Boston Xtra is especially suitable for use on magnetic paint.